Performance evaluation is conducted in all organizations at the end of a performance period. This is generally done by preparing a forecast of results at the beginning of the performance period and compare them with the actual results at the end of the period. Standard costing and budgetary control are two commonly used performance measurements by businesses. Standard costing is a system where a standard cost is allocated to units of production applicable within a specific time period. Budgetary control is a system where the management uses the budgets to compare and analyse the actual results at the end of the accounting period and to set performance enhancing measures for the next accounting year. This is the key difference between standard costing and budgetary control. Standard costing refers to the practice of assigning a standard cost for units of material, labor and other costs of production for a pre-determined time period. At the end of this period, the actual cost incurred may be different to the standard cost, thus a ‘variance’ may arise. Standard costing can be successfully used by companies with repetitive business operations, thus this approach is very suitable for manufacturing organizations. Standard costing is a management accounting tool used in management decision making to allow better cost control and optimal resource utilization. When there are variances between the standard and actual costs, the reasons for them should be researched, analyzed and remedies should be introduced by the management to ensure the variances are minimized in the next accounting period. Standard costing information cannot be used to report results in year-end financial statements as both GAAP (Generally Accepted Accounting Principles) and IRFS (International Financial Reporting Standards) require companies to report actual incomes and expenses in financial statements. Two commonly used approaches are used to set standard costs. This may involve a detailed study or observation of operations in terms of material, labor and equipment usage. The most effective control is achieved by identifying standards for quantities of material, labor and services to be used in an operation, rather than an overall total product cost. A variance is a difference between the standard cost and the actual cost. Variances can be calculated between incomes as well as expenses. E.g., Sales variance calculates the difference between expected and actual sales. Direct material variance calculates the difference between expected direct material cost and actual direct material cost. This is the difference between the expected price and the actual price multiplied by the volume of activity. This is the difference between the expected quantity to be sold and the actual quantity sold multiplied by the cost per unit. A budget is simply an estimate of incomes and expenses for a period of time. Budgetary control is the system where management uses the budgets prepared at the beginning of the accounting period to compare and analyze the actual results at the end of the accounting period and to set improvement measures for the next accounting year. 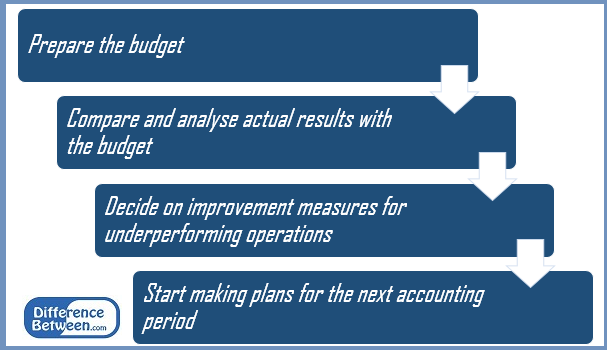 Budgetary control process consists of the following steps. Budgetary control assesses the performance of all aspects of the company and is a wider process compared to standard costing. There are five main types of budgets prepared for this purpose. This is a financial forecast of all elements in the business for the accounting year. This is usually a collection of many sub-budgets which are interrelated to each other. Operational budgets prepare forecasts for routine aspects such as incomes and expenses. While budgeted annually, operating budgets are usually broken down into smaller reporting periods, such as weekly or monthly. 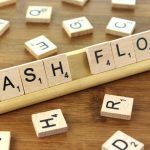 This budget projects the expected cash inflows and outflows of the business for the upcoming year. The main purpose of this budget is to ensure that sufficient liquidity is guaranteed for the period. Financial budget outlines how the company earns and spend funds at the corporate level. This includes capital expenditure (funds assigned to acquire and maintain fixed assets) and revenue forecasts from the core business activity. What is the difference between Standard Costing and Budgetary Control? Standard costing is a system where a standard cost is allocated to units of production applicable within a specific time period. Budgetary control is the system where management uses the budgets to compare and analyses the actual results at the end of the accounting period and to set performance enhancing measures for the next year. The scope of standard costing is limited to income and expenses. This spreads across a wider scope to include aspects from all financial aspects. Standard Costing is mainly practised by manufacturing organizations. Budgetary Control is used by all types of manufacturing, service and not-for-profit organization. The difference between standard costing and budgetary control is wide in terms of their uses and objectives. Further, budgetary control is a common control aspect used by all types of companies, while standard costing has limited use for service related companies. While useful, both standard costing and budgetary control are heavily dependent on forecasts, which may or may not be predictable. Moreover, both are time-consuming and costly. Situations such as unforeseen changes in demand and sudden rise in raw material prices can make the estimations less productive. 1. “Standard Costing.” AccountingTools. N.p., n.d. Web. 06 Mar. 2017. 2. “Standard Costing System • The Strategic CFO.” Creating Success Through Financial Leadership. N.p., 13 Feb. 2017. Web. 06 Mar. 2017. 3. “Budgetary Control – Definition | Meaning | Example.” My Accounting Course. N.p., n.d. Web. 06 Mar. 2017. 4. “Five Types of Budgets in Managerial Accounting.” Small Business – Chron.com. Chron.com, 12 July 2012. Web. 06 Mar. 2017. 5. Jeferson. “Budgetary control | Meaning | Objectives | Advantages | Disadvantages.” Money Matters | All Management Articles. Money Matters | All Management Articles, 22 Nov. 2016. Web. 06 Mar. 2017.